Read more and see examples of student projects. Download the PDF. Each year, budding engineers at ASU take Introduction to Engineering to lear hands-on design and apply engineering design processes in real-world settings. 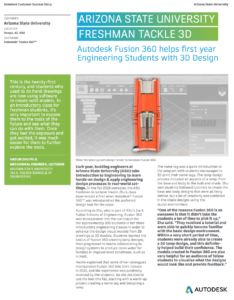 In the fall 2016 semester, the ASU freshmen in Lecturer Haolin Zhu’s class experienced a first when Autodesk® Fusion 360™ was introduced as the preferred design tool for the class. According to Zhu, Fusion 360 was incorporated into the curriculum for the approximately 100 students in her three introductory engineering classes in order to advance the design visual models from 2D drawings to 3D models. Students learned the basics of Fusion 360 creating lamp designs, then progressed to teams collaborating to design systems to produce clean water for families in impoverished conditions, such as in Haiti. 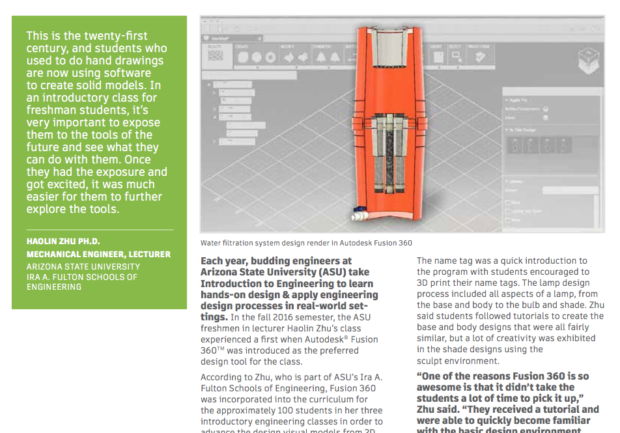 Haolin explained that some of her colleagues incorporated Fusion 360 into their classes in 2015, and the experience was positively received by the students. So she decided to use the tool this fall, starting with a warm-up project creating a name tag and designing a lamp. The name tag was a quick introduction to the program with students encouraged to 3D print their name tags. The lamp design process included all aspects of a lamp, from the base and body to the bulb and shade. Zhu said students followed tutorials to create the base and body designs that were all fairly similar, but a lot of creativity was exhibited in the shade designs using the sculpt environment. After Zhu’s students were comfortable with Fusion 360, they used it for their major design project: modeling the design of a system targeted at a family of four living in a part of the world without access to clean water. The issue of providing access of clean water is one of the National Academy of Engineering’s 14 Grand Challenges for Engineering. The student designs ranged from water filtration devices to rainwater collection and filtration systems, as well as small-scale desalination plants. “The purpose of this introductory class is not only to learn engineering design processes and basics, but also to learn how to apply their knowledge and skills to help in the real world. It’s about the impact,” Zhu said. Aside from developing the designs, students also experienced an enhanced level of collaboration and teamwork utilizing Fusion 360. In previous semesters, students created hand drawings, and when working in teams, one person would normally dominate the project. However, the collaborative features in Fusion 360 enhanced the team dynamics. Zhu, a mechanical engineer herself, added that she plans to incorporate Fusion 360 into the curriculum of some of the upper-level engineering classes she teaches, including a mechanism design and analysis class that involves designing a mechanical toy. Read more and see examples of the student projects.